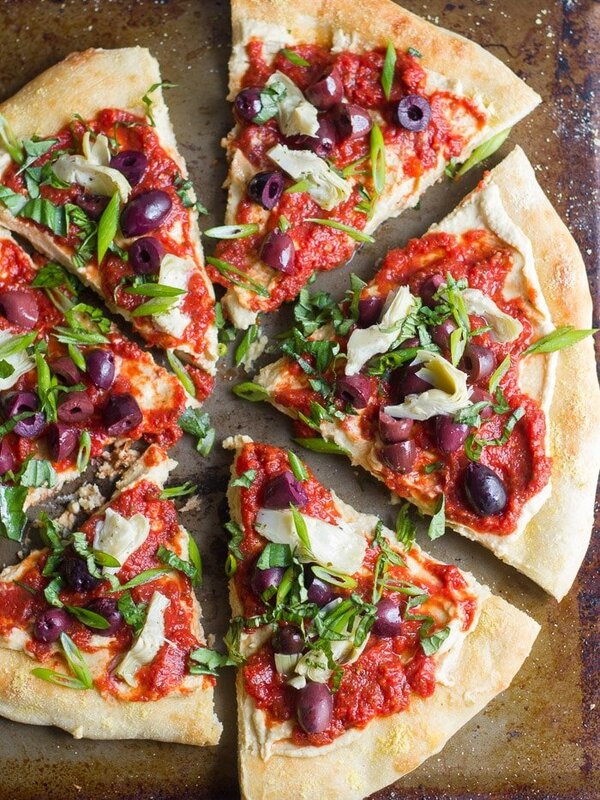 Hummus and tomato sauce are slathered onto a thick crust and piled with Kalamata olives, artichoke hearts and fresh herbs to create this flavor-packed vegan Greek-inspired pizza. 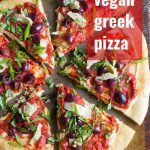 This year, it hit me: vegan Greek pizza! 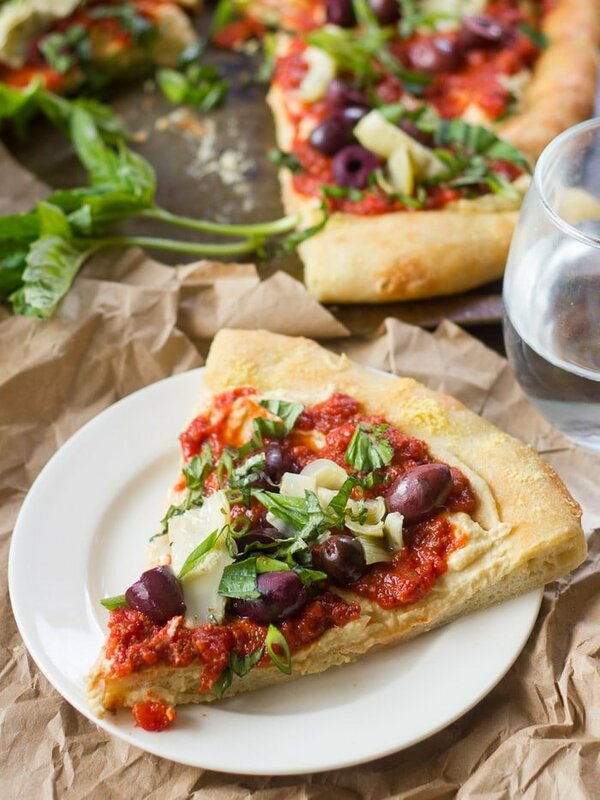 Because what better way to celebrate a beloved Greek letter than with a Greek-inspired pizza pie. This is totally inauthentic. In fact, to the best of my knowledge, there is such a thing as a Greek pizza, but it has more to do with the style of crust than the toppings. This one is all about the toppings. I’m really glad I came up with this one, because I think it’s my all-time favorite pizza. (I’m sure I said that before at some point, but this is my new favorite.) It all starts with a layer of hummus. I’ve made hummus pizza before but this one is a little different, because it also includes sauce. Hummus on the bottom, sauce on the top, and I promise you won’t miss the cheese. 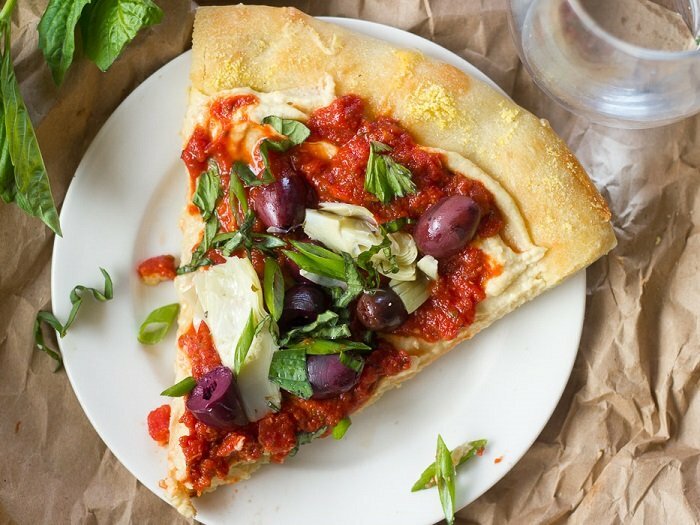 Between the hummus, sauce, and a handful of toppings, this pizza is pretty substantial. Make sure you use a nice sturdy crust! I’m not the best dough roller, and a number of times I’ve made pizza and had to patch little holes in the crust because I stretched it too thin. Try to avoid that with this one. If you roll your crust too thin or if it has some weak spots the pizza will still taste good, but you’ll have to eat it with a fork. 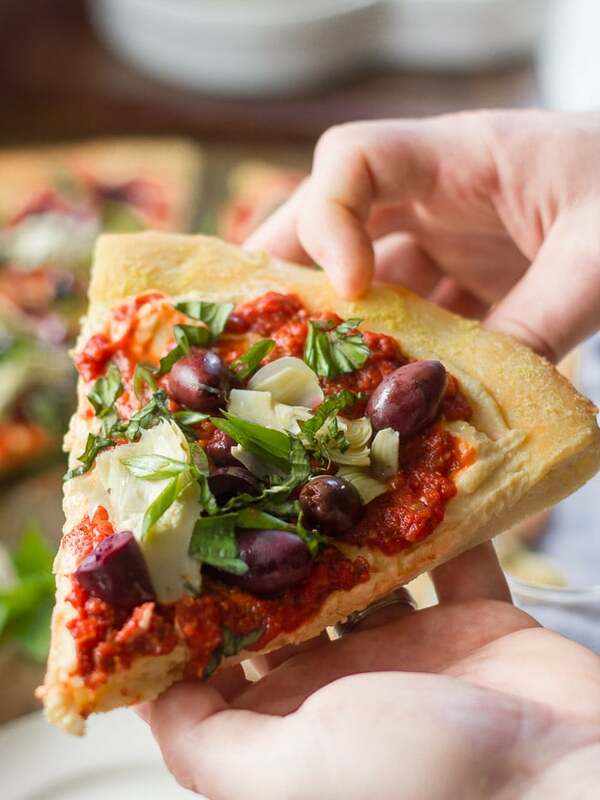 Hummus and tomato sauce are slathered onto a thick crust and piled with Kalamata olives, artichoke hearts and fresh herbs to create this flavor-packed Greek-inspired pizza. 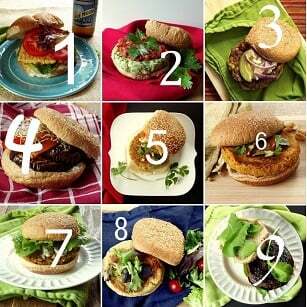 Preheat the oven to 400°.­ Lightly oil a baking sheet. Roll the dough to a 12 to 14 inch circle and carefully transfer to the baking sheet. Brush the edges with olive oil and optionally sprinkle with cornmeal. Place into the oven and bake until browned and puffy, about 20 minutes. Make the sauce while the crust bakes. Place tomatoes, garlic, oregano, and sugar into a small saucepan and set over medium heat. Bring to a simmer, lower heat, and allow to simmer, stirring occasionally, until it thickens up a bit, about 20 minutes. Season with salt and pepper to taste. While the crust bakes and the sauce simmers, make the hummus. Place the chickpeas, tahini, olive oil, lemon juice, garlic, and cumin into a food processor bowl and blend until smooth. You can thin the mixture with 1 to 2 tablespoons of water in order to smooth it out if you like, but try to keep it relatively thick. Season with salt to taste. When the crust has finished baking, spread the top with hummus in an even layer. Spread the sauce over the hummus, then distribute the olives, artichoke hearts, basil and scallions over the sauce. This pizza is best enjoyed right away. what a fun idea! i love that you made it Greek cause of pi. Why didn’t I think of that? You were right – I didn’t miss the cheese at all. This was amazing! Thank you! You are welcome! So glad that you enjoyed it!